Shake remaining ingredients except cheese and salad greens in tightly covered container. Pour over tomatoes. Cover and refrigerate, turning occasionally, at least 3 hours to blend flavors. Layer tomatoes alternately with cheese on salad greens. Slash fat grams by decreasing the oil to 2 tablespoons and adding 1 tablespoon water. 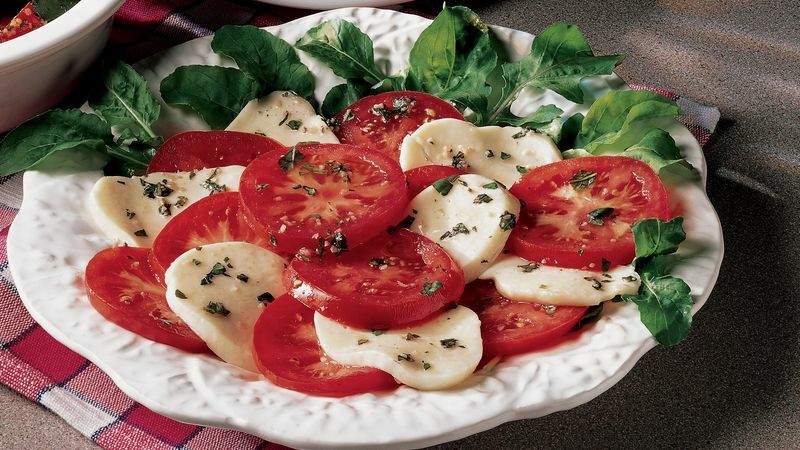 Fresh mozzarella is a soft white cheese with a mild, delicate flavor. Find it in Italian markets, cheese shops and some supermarkets.